Lahore (.SEP 29 ,2014 )The two day International Conference on Town Planning & Urban Management – 2014 began with much zeal & zest where around 300 national & international participants showed up including eminent town planners, architects, engineers, researchers, urban developers, policy-makers and students. With the Chairman of City & Regional Planning Department, Prof. Dr. Rizwan Hameed introducing the proceedings of the conference, the official start took place with the recitation of few versus from the Holy Quran. It was then followed by the welcome address by Prof. Dr. Ghulam Abbas Anjum (Dean Faculty Architecture & Planning). In his address Dr. Abbas laid stress upon the significance of Town planning & its current status in Pakistan. Then Mr. Muhammad Aslam Mughal, President Institute of Planners Pakistan talked about the activities and services being provided by the institute and its contribution to the urban management. Prof. Cliff Hague from Heriot-Watt University Edinburgh UK, spoke about the importance of Urban Governance and appreciated the conference as a step forward to sensitizing the stakeholders to adopt collaborative approaches to urban management. Then Dr. Nasir Javed CEO Urban Unit Lahore Pakistan, highlighted the challenges being faced by the urban areas of Pakistan such as infrastructure, development and urbanization and the need for change of mind set to give due importance to urban planning. 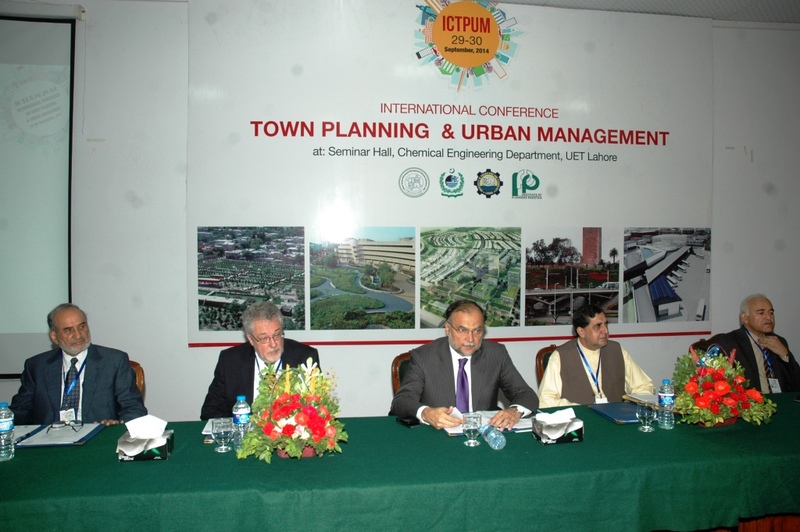 The inaugural session was chaired by Prof. Ahsan Iqbal (Federal Minister for Planning, Development & Reform) who winded up by the session by emphasizing upon the need to promote urban planning and the significance of vitality of Government & its stability in ensuring continuity of the policies including those relating to management of urban areas. The inaugural session was followed by a delightful tea break where all the participants informally interacted. The first Technical Session started right after the tea break and Prof. Dr. Tabassam Raza along with Dr. C.R.E.U. Liwag from Philippines made an interesting presentation on Risk Sensitive Comprehensive Urban Land Use and Development Planning: Mainstreaming DRR and CCA into Planners’ and Decision Makers’ Agenda with specific focus on Quezon City, Philippines. It was then followed by absorbing presentation by Mr. Khizar Farooq Omer on Sustainable Cities: Opportunity for Sustained National Growth. It was followed by a presentation from Mr. Zafar Pervez Sabri on Transforming and Managing the System of Cities in the Wake of Rural-Urban Transfer Poverty in Pakistan and by Mr. Azhr-ud-din Khan on Integrated Urban Environmental Management of Pakistan respectively. After an hour long Lunch & Prayer break, the participants gathered again to attend the second Technical Session which started off with the presentation of Mr. Imdad Hussain who spoke about Economic Governance of Lahore Region. Then, Dr. Imtiaz Ahmed Chandio from MUET, Jamshoro Hyderabad presented an Analysis of Emerging Urban Sprawl Trends and their Impact on Environment. A much interesting presentation was delivered by Syed Ayub Qutub regarding Urban Open Spaces for Adolescent Girls in Rawalpindi-Islamabad: Urban Management as if Children’s Participation and Preferences Matter. Other than the aforementioned presenters, Mr. Masood ul Hassan Jafri from Karachi, Mr. Muhammad Abdullah from Islamabad & Mr. Nazam Maqbool from Lahore also presented their research studies on Town Planning and Governance, Success Story of Gulberg Islamabad, and the Role of Urbanization for Inclusive and Sustainable Growth respectively. Towards the end, Mr. Zafar Iqbal Zafar from CDA Islamabad & Mr. Umar Akhlaq Malik shared their research findings respectively on the Development of Private Housing Schemes to Address Housing Problems: A Case Study of Islamabad and the Urbanization Process and Human Development in South Asia. The interest of the audience was revealed during the vigorous Questions Answers session which was responded well by the much receptive presenters. In this way, the first day of the Conference successfully summed up and proved to be informative yet productive for all the participants. Later the participants enjoyed sumptuous dinner and cherished the overall event while looking forward to the Day 2.